129.99 GBP Only 10 left In stock, ready to dispatch. 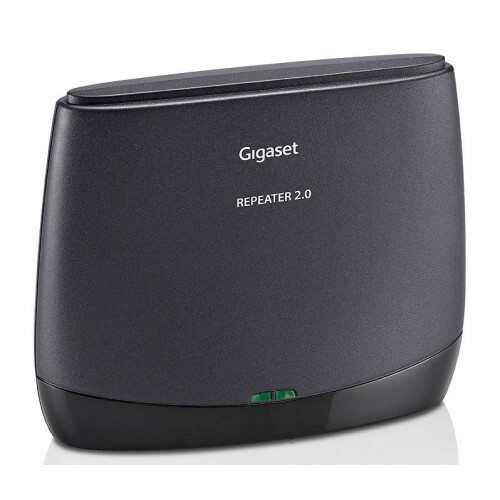 The Gigaset Repeater is a practical accessory for your Gigaset digital cordless phones, that can effectively double the range from your phone’s base station. The unit is easy to set-up, discreet, and offers reliable performance. The Gigaset Repeater registers to the base station of your Gigaset phone, which can be done by following the step-by-step guide included. Once registered the unit should be plugged into a mains power socket at the outermost limit of your phone’s signal to achieve maximum coverage. Why should you buy this repeater? If you have a Gigaset Cordless Phone and struggle with your range, then the GIgaset Repeater is a reliable and effective solution. Its quite an expensive piece of kit, but I guess you pay for the German build quality. Not an especially stylish design I have to say - not nearly as nice looking as the phone set we have from them - which is a bit disappointing, but have to say it is functional. We have quite an odd shaped house - a sort of L - and we have historically struggled to use cordless phones at one end (the smaller part of the L) so decided to try and do something about it. Called up liGo when the thing arrived and they very kindly talked me through setting it up, which seemed quite straightforward. It works very well - no longer any deadspots and we can make it even further into the garden so money well spent as far as I\'m concerned! As for the service - impeccable as ever - keep up the good work! Tried others, but this unit is by far the best DECT repeater out there, especially alongside Gigaset N510/N300. I have to agree with other reviewers. We built a large extension onto the back of our house and the Gigaset phones were already at the limit of their range. The base units are located right at the front of the house in a “facilities” room and the new extension is around 20 metres from that area. The repeater has solved all the range issues - although set up is not as straightforward as the user manual indicates. I needed to call the Ligo support team and they talked me through the set up in two minutes. Excellent product - but a bit pricey. Could not fault Ligo tech support. Best repeater over a long distance I have ever had.